I just had my first Gluten Free Tea Party. Nine of us dressed up for the occasion with hats, lace gloves, fans and parasols; and we spoke with British accents. It is likely that the English would be amused, shocked or even offended by our Americanization of the Afternoon Tea, but we had an irreverently grand time. The menu consisted of savory and sweet items and an assortment of delicious teas. 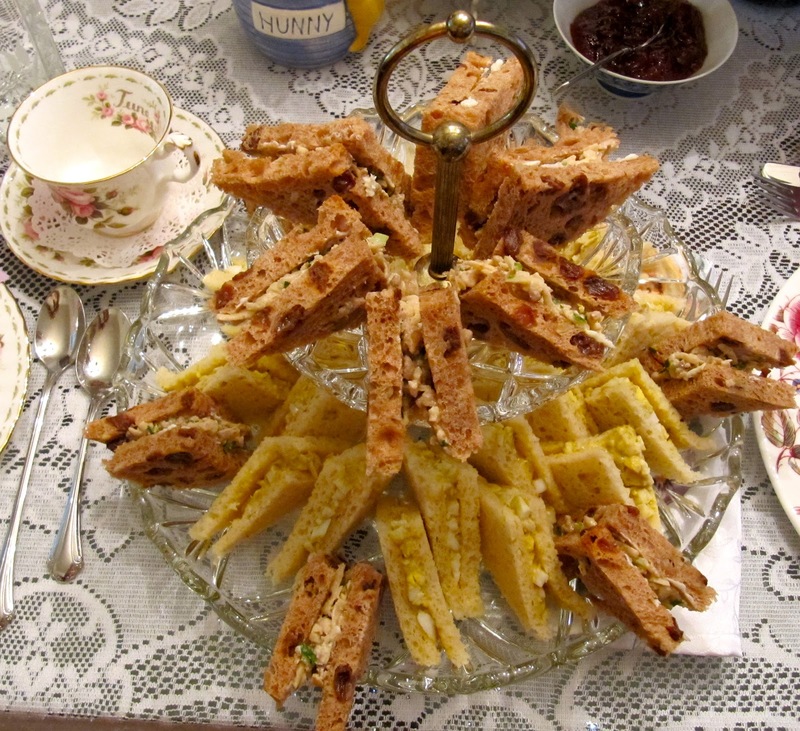 In my next few blogs I will be posting the recipes for everything I made for the Tea Party. I went a bit overboard with the sweets and would suggest omitting the Russian Tea Cakes and or the Brownie Bites if you follow this menu. It is difficult to find ready made dainty GF baked goods that are really delicious and as good as or better than regular baked goods. For this reason I baked all of the desserts myself. The bread makes or breaks the sandwich. I bought a good GF Raisin Bread by Canyon Ranch and I made the bread for the other sandwiches. I love to bake and I love to entertain, so baking the bread was fun for me. I chose to bake a GF Challah Bread recipe that I have made before. It is moist and delicious and is good eaten without being heated or toasted even if it is four or five days old. It was easy to cut into thin slices with a serrated knife. I baked the loaves two days before the Tea; cut off the crusts and sliced it the day before. The sliced bread kept well in a plastic baggie. I put the leftover crusts into the food processor to make breadcrumbs and froze them for later use. All of my guests (only one of which is GF) remarked about how much they liked the bread that I made. Next time I will make the raisin bread also. I might just add raisins and cinnamon to the GF Challah recipe that worked so well. I asked everyone to bring their favorite teas and as a group we decided which ones to make pots of. It was almost 100 degrees outside, and someone brought Stevia sweetened Iced Teas to share. Planning the Tea involved many details. First of all I decided what kind of Tea Party to have. I researched about Teas on-line. Tea Time in England is when people will sit and have a cup of tea with a biscuit (cookie), scone, sandwich or some sort of light fare to tide them over until supper. High Teas are a heavy substantial meal. There are Southern Teas, Children’s’ Teas, Morning Teas and Summer, Fall, Spring and Winter ones. Afternoon Tea is more of what we think of when we say Tea Party. You can make it as formal or casual as you like with savory and/or sweet goodies. I think that you can make it whatever would be special to you. I decided on an Afternoon Tea that was a little formal with both sweet and savory items. After deciding on the date and time, invitations were made on the computer and sent via e-mail. Depending on the occasion, you could do the traditional paper invites and mail them. Next I planned the Menu. Again, I searched the Internet for ideas and recipes for teas sandwiches and desserts. You will need 6-8 sandwiches per quest. Each sandwich is the size of ¼ slice of bread. You can cut them diagonally or into narrow rectangles. Per 2 slices of bread you can make 4 finger sandwiches with my homemade recipe. The store bought raisin bread was smaller and made 2 finger sandwiches per 2 slices of bread. Some people use cookie cutters to make heart or flower shaped sandwiches. I did not do this because it wastes quite a bit of the bread. GF bread is more expensive than regular bread and I also would have had to bake more loaves to make enough sandwiches for nine people and I knew I would be doing quite enough baking already. I counted my teacups and saucers, teapots, dainty plates and serving dishes. I asked my guests to contribute their Tea worthy things to make up for whatever I was lacking. My friends were happy to get into the spirit of the party and eagerly collected their teacups & saucers, fancy serving dishes and pretty teapots. Party favors are a tradition I love. I decided to give each guest a pretty porcelain teabag holder. There are other tea themed favors such as teapot shaped tea strainers, tea bags, teacups, teaspoons, etc. that could be used depending upon your friends and your budget. In the dollar store I found 9” circles of tulle, thin ribbon and tiny ribbon flowers in coordinating colors and I used these to wrap the favors. I made place cards by printing out each guests name on colored paper that matched the favor wrapping and then attached the name tags to each favor. Since I was baking so many items I made a list of what had to be done and organized the tasks by days of the week and started preparing food three days before the Tea. Butter cookies keep well for many days, so I made them first. I also measured out, labeled and put in plastic baggies all the dry/flour ingredients for everything else I would be baking later in the week. By the day of the Tea only the sandwiches needed to be put together (sandwich fillings and spreads were all ready prepared) and the scones needed to be mixed and baked. Scones take very little time to mix (especially if the dry ingredients are ready in a baggie), shape and bake and I wanted them very fresh for the Tea. The table was set a few days before the Tea. I printed out small menus and put them by each place setting. I asked a friend to come early on the day of the Tea to help make sandwiches and set up the food. Finally we all sat down to Afternoon Tea. I made sugar ‘cubes’ myself by pressing moistened sugar into rose shaped candy molds and ice cube trays with small holes. Everyone wanted to try them in their tea, so between the sugar cubes and the sweets we were all on a sugar high. We got quite silly, but this cannot be blamed entirely on the sugar. We enjoyed tasting the different teas and we ate a remarkable amount of food. All my guests really appreciated the detail and work that went into the party. Rave reviews were received for all the food. This may just become an annual tradition. We are talking about having a Southern Tea soon and each of us will make some of the food. Corn bread, Mint Juleps, sweet potato pie...what other southern food can be served for Tea? This recipe has a rich banana flavor and a lighter texture than most banana bread or cake recipes. I converted a regular banana cake recipe that I found on the Internet into a GF one. Roasting the bananas in their skins before using them in the batter is what makes the banana flavor so strong. My son is Vegan and I have friends and relatives who are diabetic so I have also made this recipe as GF Vegan, GF Dairy-Free, and GF Sugar-Free as well as GF Sugar-Free Vegan. The recipe holds up well in all these variations and the cake stays light. In the Sugar Free version I use Stevia extract powder and it is hard to taste any difference from the sugar version, though the batter does not rise as much. When baking with Stevia I have found that it works well in recipes where there is naturally some sweet flavor, as with fruit, in carrot cake or with dairy products. It seems that with Stevia there is a delayed reaction and it takes a little time for you to register its sweetness. If you have some immediate sweet taste, like banana, to carry over the sweet taste until the Stevia registers then the Sugar-Free recipe will be more successful. Chocolate is bitter and when you bite into a chocolate cake sweetened only with Stevia you will be going "ewww" from the bitter taste of the chocolate way before you get any sweet taste from Stevia. This is not a pleasant experience, nor one I would recommend repeating. With more sour or bitter foods it tastes better when you add some sugar or other sweetener as well as the Stevia. The sugar or other sweetener will have an immediate sweet taste that will hold you over until the sweetness of the Stevia can be detected. In this recipe I use pure Stevia Extract Powder. Stevia comes in many forms. The packets that are used in hot beverages contain fillers and should not be used in this recipe unless the amount is adjusted. I have never used the liquid Stevia in recipes because I always am trying to reduce the liquid contents of GF recipes as the end product tends to be too 'wet' for my liking. Here is a link to a page that is very helpful in explaining how much Stevia to use to replace sugar in a recipe. Sweetleaf Stevia Conversion Table. Roast bananas in their skins for 20 minutes turn over and roast 20 minutes on the other side. If using ripe bananas bake 10minutes per side. Cool, then mash and use in recipe. In a separate bowl mix dry ingredients. For Sugar-Free version add Stevia Powder to dry ingredients at this step. In a large bowl mix butter or oil into the mashed bananas . Mix in the sugar (for Sugar-Free do NOT add Stevia to wet ingredients-add to dry ones INSTEAD), egg (or Vegan 'egg' replacer), and vanilla. Add dry ingredients to the banana mixture and mix well. Lastly add vinegar and mix in well. Pour mixture into a buttered 4x8 inch loaf pan. Bake for 1 hour. Cake is done when it springs back when pressed lightly with a finger or when a toothpick inserted to the center comes out clean. Cool on a rack 10 minutes then remove from pan to cool completely on rack. Slice to serve. To make cup cakes use paper liners in a muffin tin and bake for 20-30 minutes. Makes about 18 cupcakes. I use a 1/4 cup scoop to measure out the batter into the paper liners. Cup cakes are done when they spring back when pressed lightly with a finger. GLUTEN FREE BANANA CAKE Ingredients 3 Ripe Bananas-mashed. For stronger banana flavor roast bananas with skins on (see directions below) 1/3 cup Melted Butter- for Vegans or Dairy-Free use an equal amount of olive oil or melted Earth Balance Buttery Stick ¾ cup Sugar - for Sugar-Free use ½ tsp. of pure Stevia Extract Powder 1 Egg – (for Vegans: in a separate cup add 1 Tbs. Corn Starch, 1/8 tsp. Baking Powder, 1/16 tsp. Xanthan or Guar Gum, ¼ cup Water and 1 tsp. oil. Mix these well together with a fork or small whisk until frothy. Add to recipe where an egg is called for. This is a good 'egg' replacer in cakes.) 1 tsp. Vanilla 1 tsp. Baking Soda Pinch Salt 1 cup Sorghum Flour ¼ cup Tapioca Flour ¼ cup Chickpea or Chickpea/Fava flour 1 tsp. Xanthan or Guar Gum ½ tsp. Cinnamon 1 Tbs. Vinegar Directions Preheat the oven to 375°F. Roast bananas in their skins for 20 minutes turn over and roast 20 minutes on the other side. If using ripe bananas bake 10minutes per side. Cool, then mash and use in recipe. In a separate bowl mix dry ingredients. For Sugar-Free version add Stevia Powder to dry ingredients at this step. In a large bowl mix butter or oil into the mashed bananas . Mix in the sugar (for Sugar-Free do NOT add Stevia to wet ingredients-add to dry ones INSTEAD), egg (or Vegan 'egg' replacer), and vanilla. Add dry ingredients to the banana mixture and mix well. Lastly add vinegar and mix in well. Pour mixture into a buttered 4x8 inch loaf pan. Bake for 1 hour. Cake is done when it springs back when pressed lightly with a finger or when a toothpick inserted to the center comes out clean. Cool on a rack 10 minutes then remove from pan to cool completely on rack. Slice to serve. To make cup cakes use paper liners in a muffin tin and bake for 20-30 minutes. Makes about 18 cupcakes. I use a 1/4 cup scoop to measure out the batter into the paper liners. Cup cakes are done when they spring back when pressed lightly with a finger.